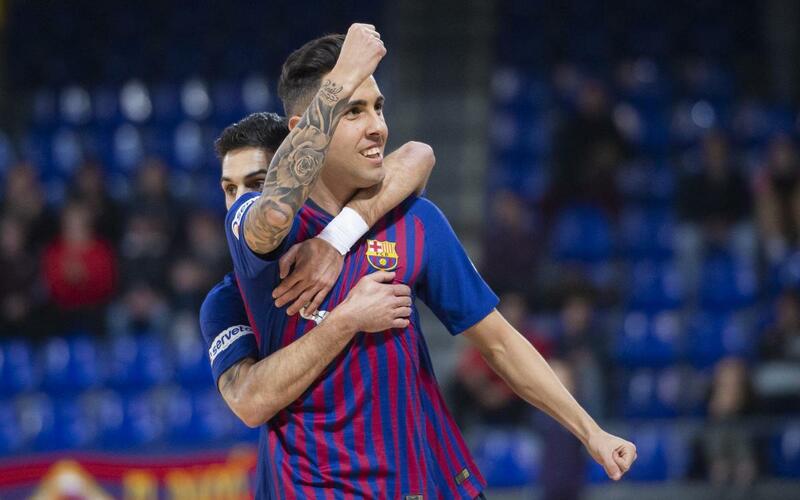 Barça Lassa bested Levante 4-2 on Matchday 19 of the league season at the Palau Blaugrana, in a victory that they dedicated to Sergio Lozano in his absence due to the death of his father. The win keeps the team at the top of the table, and was also the debut of Marcenio for the club. The goals for Barça Lassa came from Joselito, Aicardo, Ferrao and Javi Rodríguez (OG), with Cecilio and Márquez scoring for the visitors. The match started with an early goal for Joselito in the 4th minute, and Aicardo doubled the advantage 5 minutes later. Marcenio made his debut after 11 miutes, coming on for Boyis. Levante would make their way back into the game, however, as David Madrid and Marquez pulled the away side level with two goals. Barça Lassa reestablished a lead just before the break, as Ferrao's volley went in off Javi Rodriguez to make it 3-2. An even second half became more dominant for Barça Lassa after the 30 minute mark, and Adolfo, Arthur and Léo Santana all came close to further goals. In the 35th minute, Ferrao scored the goal that took the score to 4-2, beating opposition goalkeeper Raul in trademark style. The fans were fully behind the side in the final stretch, willing the team on as they held on for another victory. Goals: 1-0 Joselito (min 4), 20 Aicardo (min 9), 2-1 Cecilio (min 12), 2-2 Márquez (min 14), 3-2 Javi Rodríguez own goal (min 20), 4-2 Ferrao (min 35). Officials: Moreno Reina and Peña Gómez. Yellow cards for Sena (min 9) and Márquez (min 20).